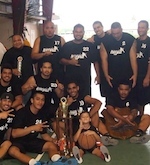 The boys from American Samoa will be able to showcase their talent in the upcoming FIBA Oceania Youth Tournament for Men in Auckland, New Zealand. The team will be made of the best high-school players of the island but that might not be enough to compete for a medal. American Samoa is not used to play in the FIBA Oceania Youth Tournament but the country has maybe the best high-school basketball program of all the South Pacific countries, if you let Australia and New Zealand aside of course. Thanks to the high-school league, Am Samoa official are able to scout the finest prospect of the country and the team should come to New Zealand will the best roster available. of course, US-based Leroy Lutu (180-G-89) was unable for this tournament. Unfortunatly, American Samoa will lack experience and might have some troubles to reach the semifinals. You can follow this tournament on our special "FIBA Youth Tournament 2006" page, we will post a recap of the team's games during this event in the days following the Gold medal. Stay tuned.